Rummage through all the flirty, fun and fabulous blouses to pick out your absolute favorite. These cute and flirty shirts are very similar to the peasant blouses for women available. While many peasant shirts have cuffed sleeves as well as embroidery on them, a typical Mexican inspired one is usually always embroidered and comes from south of the border. Peasant blouses are pretty much inspired by the traditional blouse from Mexico. I love, love, love these blouses because they are summery, fresh and look super chic and trendy. They can be long sleeve or short sleeve and they are usually made of lightweight cotton or other lightweight materials. Most of them are all handmade and just exquisite with their gorgeous embroidery. Whenever I have one for sale, I will post it here! So be sure to check back to find a cute shirt. All of these below are listings from either Ebay or Amazon. So please take a look and see if you can find a good buy for yourself. A Mexican blouse should really only be called so if it comes from there, however, many blouses can be Mexican inspired and copy the detailed embroidery that is so popular. If you are not sure about where it comes from, or if it really matters to you, then please be sure to ask the seller. Bid with confidence on Ebay! Find a cute Mexican dress for the summer or transition it to the winter! 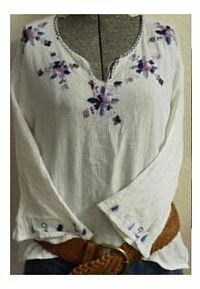 More Mexican inspired blouses, the peasant blouse looks just the same, but not always made in Mexico. Find some beauties here.